How can I connect two different DC power sources together? How can I connecting two different DC power sources together? 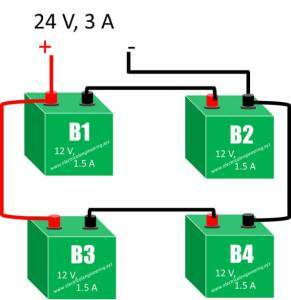 for example 15Vdc(5Amp) with 5Vdc(2Amp). I want to make one DC source (20Vdc,7Amp) by more powerful supplies. You can connect them in series to add the voltages, but the resulting current capability will be the lower of the two current ratings. Think of it like tying a 5 foot and 15 foot rope together. You get a 20 foot rope, but its strength is whatever the strength of the weaker rope is. No, you can't put two supplies together in any way to add both their current rating and their voltage. This should be clear just from the power output alone. The 15 V 5 A supply can deliver 75 W. The 5 V 2 A supply can deliver 10 W. Both together therefore can't deliver more than 85 W. However, 20 V at 7 A would be 140 W. That's a free lunch physics won't let you have. If you want 20VDC from a 15VDC supply and a 5VDC supply, you would connect them in series. However, you must make sure that they are floating with respect to ground. If both supplies are grounded, then you cannot connect them in series. Also, note that the maximum current that can be drawn from the series connected supplies is equal to the lower of the current ratings of the 2 supplies. In your case, connecting a 2 amp supply and a 5 amp supply in series results in a supply that has a maximum rating of 2 amp. Power = volts x amps. So you want to get (20*7) 140W out of (15*5) = 75W + (2*10) = 10W. 75+10 is less than 140, so it cannot be done. How to connect supplies together is complicated and depends on the type of supply, so don't just connect supplies together without finding more. You make more volts by connecting in series, and you make more amps by connecting in parallel, you can't have more of both! In present case, you can't obtain the desired output. There are three types of battery (DC Source) connections you should remember. Series-Parallel Connection Such connection is used for adding amps, as well as volts but remember the rules. Both of above are applicable here. Hopefully, the info above is quite enough and it helps you. 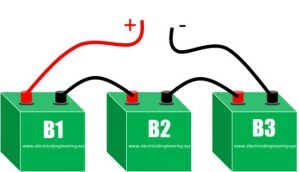 For more details check this link on 3 different types of battery connections with mathematical calculations. You can connect the +ve of one supply to the -ve of another supply to get 20V, but you will be limited to the smallest supplies current (2 amps in this case). How to simulate several voltage sources from one?